If nirvana is a place of complete bliss and delight, then it is no surprise that Portland is commonly referred to as Beervana. With over 30 microbreweries in the metro area, the city is a dream for any beer lover. In fact, a recent poll by GoTime.com named Portland the best city for happy hour in America (due in part to the number of microbreweries per capita in addition to some amazing food — but that’s a whole other story. For now let’s focus the beer). So what’s it like living in Beervana? Well it’s pretty great, actually. There are more beer options than you can think of – from the sweet, kool-aid colored Razberry Wheat beer at Cascade Brewing to Rogue’s super dark Dead Man Ale. With so many choices you’re bound to find something to satisfy your taste or at the very least give you a nice buzz. Not sure what you like? 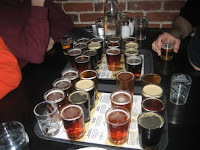 Most breweries offer sampler platters so you’re not stuck with a whole pint of something you don’t like. -All breweries are within walking distance of each other — making for a great tour! This is just a tiny snapshot of the beer scene in Portland but I assure you its much larger than I could fit into one post. If beer isn’t your scene then you might like to check out the new boom of micro-distilleries on Distillery Row or visit one of the local wineries in the area (I’d recommend Montinore). On the other hand if beer IS your scene then come visit us here in Beervana. We also offer our Brewery Experience in the Pearl with Bridgeport, Rogue, and Deschutes. Our tour includes all your tasters ,tours of the breweries, and fun historical facts. 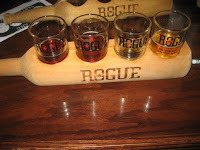 Rogue also makes their own liquors. It’s a fun way to experience the Pearl and the Amazing breweries in the area. I love Portland!